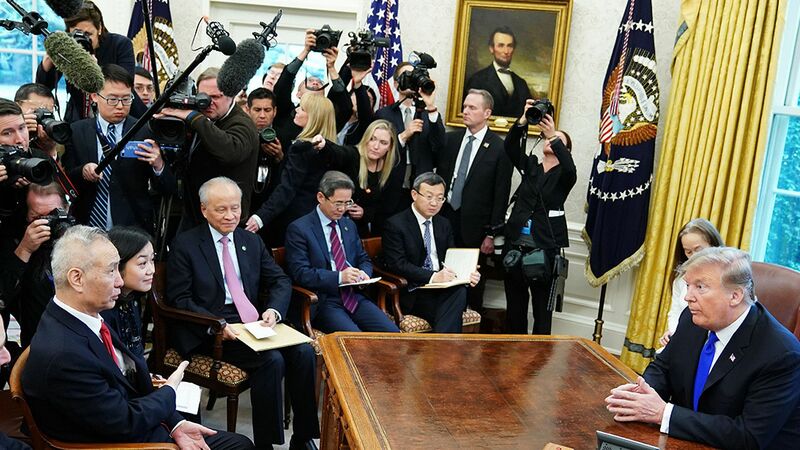 U.S.-China trade negotiations continue after talks end with "new progress"
The U.S. and China "smoothly concluded" the latest round of trade talks and would work through remaining issues "through various effective means," the Chinese state-run Xinhua news agency reported Saturday. What they're saying: "The two sides discussed the agreement text on technology transfer, protection of intellectual property rights, non-tariff measures, services industry, agriculture, trade balance and enforcement mechanism, and achieved new progress," Xinhua said. Why it matters: The remarks on Friday's conclusion of the 9th round of trade talks reveal new details of the issues overcome. Chinese Vice Premier Liu He met with President Trump Thursday. Trump said discussions were "moving along nicely" and there was a "very good chance" the 2 countries would reach deal. The White House said in a statement "significant work remains." The big picture: Trump said last month he would keep tariffs in place on Chinese goods for a "substantial period." What's next? White House economic adviser Larry Kudlow told Bloomberg TV negotiators would "be in touch" by phone next week. Go deeper: U.S.-China trade talks: Consensus reached on "many key issues"